Moriarty's Luca Luppes fighting for possession in the Pintos' season-opener. Moriarty High School’s boys soccer squad picked up a pair of victories in its first two games of the 2018 campaign. Jordan Horoschak’s goal in the waning minutes of Moriarty’s Aug. 29 game at Albuquerque’s Bosque School lifted the Pintos to a 1-0 win. “C.J. Trammell and the defense played great,” Moriarty head coach Jordan Allcorn said about the win over Bosque. Trammell is the Pintos’ new goalkeeper, taking over for Ethan Tolleson who graduated in May. The day before the Bosque matchup, Trammell’s six saves helped the Pintos secure a 4-2 season-opening victory over the visiting Bernalillo Spartans. Seth Thompson led the Pintos’ offensive attack with a pair of goals, the first one—his first ever as a varsity player—came in the game’s 11th minute. “I got the ball and chipped it right over [the Bernalillo defender] and it went in,” Thompson said. 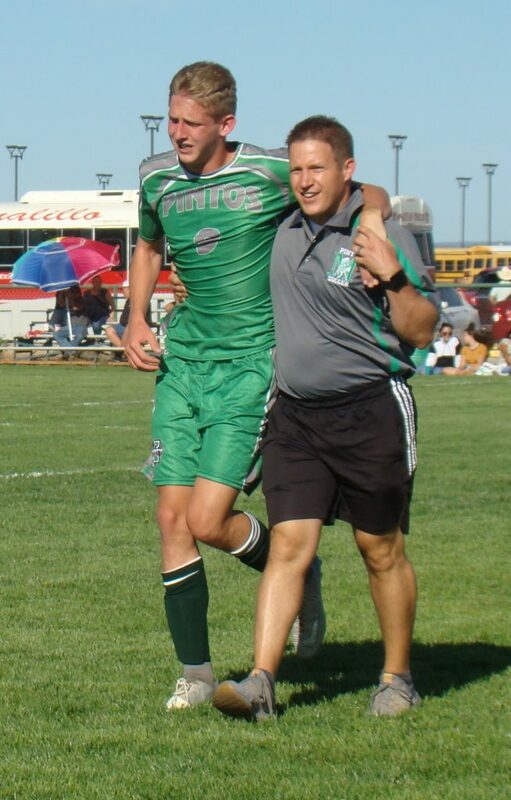 Jordan Allcorn helping Frank McCleave off the field after McCleave’s sustained a leg injury against Bernalillo. Seven minutes later, Thompson took a cross pass and tapped it into the corner of the net to give the hosts a 2-0 advantage. A minute after the Spartans trimmed the gap to 2-1, Frank McCleave’s header off a Moriarty throw-in sailed to the back of the net to boost the Pintos lead to 3-1. “It came over a couple of kids, took a really nice bounce, and I was just in the right spot for an easy finish,” McCleave said. Fifteen minutes into the second half, McCleave got tangled up at midfield with a Bernalillo defender and both players tumbled to the turf. McCleave had to be helped off the field, clearly in pain. In the 61st minute, Jahlani Graham grabbed a through ball inside the 18-yard box, took it to the 6-yard area and poked it into the left side of the net. “Someone sent it from midfield and I just pursued it,” Graham said. 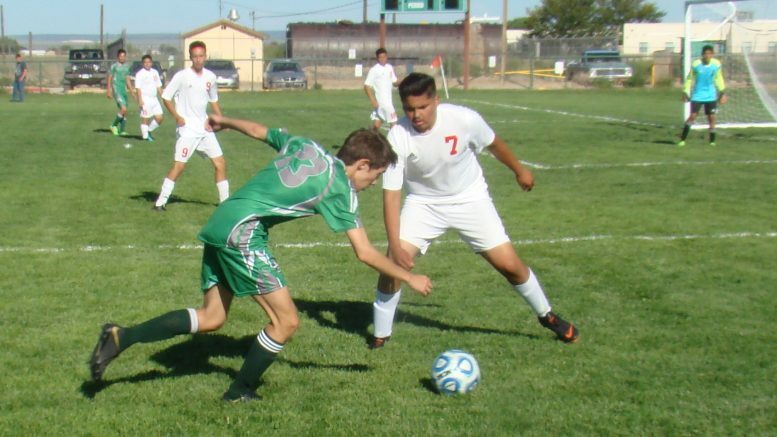 Bernalillo scored an inconsequential goal in the game’s final minute. Allcorn noted that it’s still early in the season and there are things his team needs to improve on. The Pintos’ next game is Sept. 1 at 1 p.m. at home against Artesia.